I thought I'd lost you, lemon meringue. I thought I'd lost your after dinner taste, the way you lingered on my parents' white enamel stove top, sturdy glass pressing hard against the black coil face. It's hard to justify you or that other old favorite—banana cream—these days. But the other evening, when the light got long and I could almost feel my junior high lacrosse uniform brushing my knees, when I could almost hear the mudroom door clang, feel the shutter behind me as my sister dropped her stick and bag—it was like we were rushing in again to see you waiting, wafting, quiet on your perch. It was almost real: my mother with the salad spinner whirring, whirling, pressed against her belly tight, the stairs creaking as my father came down from his desk and we clamored up. There you were by my mother's side still steaming, white-peaked and hot, while across the room my father poured his evening gin and tonic, arranged a bowl of ice cold Virginia Diner peanuts, and sat us down to talk through school and sports and lunch. Almost real, but not quite, that is. But then that same night I picked up a bag of cranberries from the fridge—my fridge, 234 miles south. I popped one in and puckered my mouth in that same tart-sweet characteristic lemon pout. You, lemon meringue, could go cranberry! I thought. I looked online and there they were—cranberry meringue pie instructions on the Celebrate Boston 1930s recipe site. Like most first tries you weren't quite—not right, not what I expected—not lemon, I suppose. 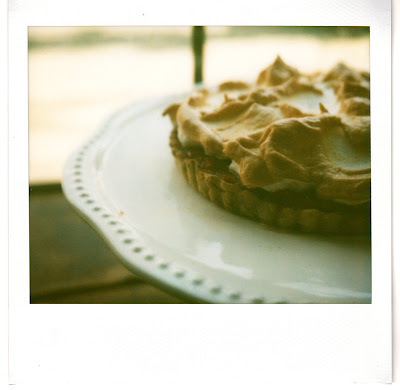 But then we tried again and again—gave you body and custard and zest—and finally there you were: all lemon meringue soul in a Cape Cod cranberry tart. It's so nice, meringue pie, to have you home. I love this twist on the classic lemon meringue. It is unexpected, beautiful, and best of all tart, custardy, and delicious. I'm not going to give a crust recipe here, because the one I use is already detailed over here at Smitten Kitchen. The filling was inspired by the 1930s recipe for Cranberry Meringue Pie over here, although it has undergone a fairly significant overhaul. Both fresh and frozen cranberries work equally well, making this one of the Cape's few year-round fruit pies. Combine the sugar, cold water, and cranberries in a medium-size pot over medium-high heat. Bring the mixture to a boil, stirring occasionally. After about three minutes, the cranberries will start to pop; turn the heat down to medium and keep cooking, stirring occasionally, for another five minutes, or until the fruit has all popped and come together with the water and sugar to form a thick, almost jelly-like substance. Turn the heat off and let the fruit cool for 5 minutes, stirring occasionally to help the process along. In the meantime, in a small bowl, whisk together the flour, egg yolks, and salt until smooth. When the cranberry mixture has cooled slightly (you still want it to be fairly warm, but not so hot you can't stick a finger in—if it's too hot it will curdle the milk), slowly pour in the milk and cream. Stir well, then pour 1/2 cup of the warm milk and fruit into the egg yolk mixture, whisking vigorously as you do. (Again, this will temper the yolks, so that they don't overheat and curdle.) Now whisk this tempered yolk and berry mixture back into the pot of fruit and milk. Turn the heat back on to low and simmer, stirring constantly with a (heat-proof!) spatula until the yolks, milk, and fruit come together into a thick, creamy custard. (After several minutes, the mixture will start to steam, and about three minutes after that, it should be thick enough to coat the back of the spatula; that's what you're looking for.) Turn off the heat and add the vanilla and butter; keep stirring until the butter is absorbed. Spoon the custard into a medium-size mixing bowl, press plastic wrap over the top of the mixture so that it doesn't form a skin, and put it in the refrigerator to cool. When you are ready to bake the pie, preheat the oven to 325 degrees F. Get out the pre-baked pie crust and the cooled cranberry custard, and spoon the custard into the tart shell; the filling should just reach the top of the crust sides. In a stand mixer or large mixing bowl, beat the egg whites and confectioners' sugar until the mixture forms stiff peaks. Spoon this over top of the custard, dropping the egg whites in even dollops over the top of the tart to form a series of valleys and peaks. Bake on the top shelf of the oven for 15 minutes, or until the egg meringue peaks are golden brown. Serve warm, or at room temperature. You'll have to let us know how it comes out. I have an extra batch of filling from all my testing tucked away in the fridge, so I'll be making another one this weekend too! As for the justification, I just can't find any local lemons. Some people grow them—my friend Corey has a tree—but we aren't quite there yet. I don't mind using lemons sometimes, but it seems silly for them to be the focus of a dish when we have something else perfectly tart grown right here on the Cape. 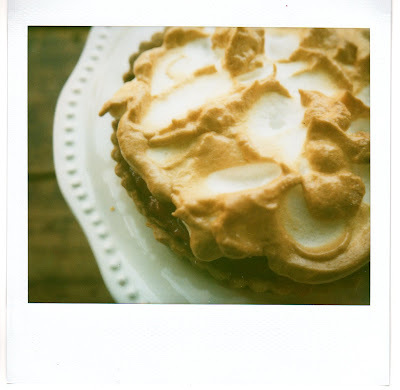 Lemon meringue has always been one of my favorites, too, so I was glad to have discovered this new twist. Happy baking and enjoy the sun !